eDesk is a comprehensive customer help desk that is totally designed and geared for e-commerce. It provides e-commerce businesses with a powerful platform to help them centralize and manage all their support operations, information, tools, and other capabilities. Users enjoy instant visibility overall aspect of their customer support operations. Customer, product, and shipping information are constantly updated and matched to provide agents with reliable details. All relevant customer information are displayed in full view, enabling agents to deliver impeccable, personalized customer support at any instance. eDesk routes tickets, calls, and queries to agents who have the best tools and expertise for faster response and resolution. eDesk provides you with a centralized inbox where you can store all your customer queries and all other relevant details including order information, social channels, and shipping. It is an ideal tool whether you operate a single e-commerce site or sell via multiple channels, eDesk connects you to your customers rapidly and seamlessly and vice versa. This accelerates the entire customer support process as it eliminates the need to log in to every marketplace and respond/resolve queries individually from there. eDesk offers detailed and invaluable reports that delve on your agents’ overall response performance, SLA compliances and real-time data on sales. With these reports, you can determine the best way to use your resources more effectively, improve customers satisfaction and boost your support team’s productivity as individuals and as a collective unit. eDesk has an automated feedback request feature that helps you automatically send feedback requests from your customers across all platforms and channels. With this capability, positive seller feedback and reviews for you to share as you gain lessons from the negative ones. Positive reviews tend to give your rank a huge boost, enhance your brand’s reputation, and drive more sales. 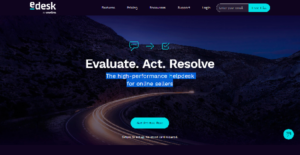 What Problems Will eDesk Solve? 1) Ensuring all queries are resolved quickly. Online sellers may sell products on a number of different marketplaces and channels. This makes it more difficult to respond to all the customer queries in a timely manner. With AI generated responses, it helps them to choose an appropriate response to customer tickets and also, makes the process much quicker. Feature: AI generated responses for one-click ticket resolution. One of the most important things as an online seller is that you have a good reputation. When you sell on Amazon, for example, positive reviews and ratings can help you rank higher. eDesk will send automated feedback requests across all platforms to encourage customers to leave reviews and help increase sales. Foremost, eDesk allows people to sell in countries that they may not have been able to before. This unlocks growth opportunities for our customers that didn’t have these skills previously. Customers may send queries in different languages, which can happen regularly if you are selling on a number of global marketplaces such as Amazon France or Amazon Germany. This makes responding to them more difficult and time-consuming for the support agents, especially if they are not fluent in that language. With the help of eDesk’s auto-translate feature, all support agents can respond to those customers correctly and in the appropriate language at any time. Enterprises have diverse needs and requirements and no software platform can be ideal in such a situation. It is pointless to try to find a perfect off-the-shelf software app that fulfills all your business requirements. The wise thing to do would be to adapt the system for your unique requirements, staff member skill levels, budget, and other elements. For these reasons, do not hasten and invest in well-publicized popular systems. Though these may be widely used, they may not be the ideal fit for your specific needs. Do your groundwork, investigate each short-listed platform in detail, read a few eDesk reviews, speak to the seller for clarifications, and finally settle for the app that provides what you need. How Much Does eDesk Cost? We realize that when you make a decision to buy Help Desk Software it’s important not only to see how experts evaluate it in their reviews, but also to find out if the real people and companies that buy it are actually satisfied with the product. That’s why we’ve created our behavior-based Customer Satisfaction Algorithm™ that gathers customer reviews, comments and eDesk reviews across a wide range of social media sites. The data is then presented in an easy to digest form showing how many people had positive and negative experience with eDesk. With that information at hand you should be equipped to make an informed buying decision that you won’t regret. What are eDesk pricing details? What integrations are available for eDesk? If you need more information about eDesk or you simply have a question let us know what you need and we’ll forward your request directly to the vendor.